Here we’ll introduce a key understanding about learning. If you are not using the latest science on how the brain learns when making decisions for student achievement, you are not giving the teachers and students the tools they need. We all know that highly effective teachers come in many shapes, they teach a wide range of content and that they may show up in various and even surprisingly places in kid’s lives. Brains rarely change through random events in our lives. It does happen (for example, a car accident may produce a head trauma). But most of our changes come about via genes (we grow, mature, change brain chemistry and hormones), environment (e.g. marginal nutrition, a caring parent or daily smog) or the interaction between the two. This is all about brain-based teaching. With some support, you can become very good at this. The changes we are talking making are the result of highly effective “teachers.” The “brain-changing teacher” could be a mentor, classroom teacher, coach on a school team, special ed teacher, counselor or music teacher. What you’re about to learn is what they have in common. You’re about to learn “the key to the vault.” These factors are typical and commonly found in most teachers who change kids for the better. Not every teacher uses every single “right” factor. But most of them use most of the factors. The ones that are “over the top” successful, may use nearly all of them, relentlessly. Here is a top ten factor for boosting achievement. If you want students to get better at a skill or have an insight, there have to be “stakes in the game.” They must have a chance to make, learn from and correct mistakes. In other words, they need a risk with chance to fail. Why is the act of making mistakes so critical to changing the brain? The brain systems processing our experiences are thought to engage the utility of reward, feedback and relevance (Kilgard, M and Merzenich, M., 1998) Each of these are known to play a large role in producing brain changes. The mistake followed by awareness and effort will change. This is why a thoughtful brain is better at realizing a mistake and even the reflection process can change the brain (Levy, LM., 2007). This is why the “feedback factor” ranks a whopping 0.73 in effect size, a top ten “high-yield” teaching factor (Hattie, 2010). 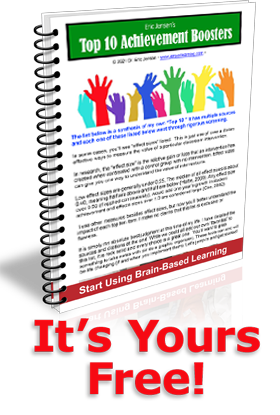 You see, brain-based teaching is about using the brain’s feedback systems to enhance student outcomes. Many schoolteachers are tempted to just tell kids the facts, the insights and rules. But that kind of learning (“book learning” or “lecture”) won’t change things as fast as real world experiences. Sitting around is far too common for secondary students. Many secondary students are disinterested and bored. Studies show secondary students spend 28% of their day, on average, in a state of apathy (Shernoff, D., Csikszentmihalyi, M., Schneider, B. & Shernoff, E.S., 2003), The things that kids enjoy the most in school are usually experienced based and have feedback built-in. These would include social contact, teams, clubs and peer interactions. In addition, debates, project learning and the arts (Yazzie-Mintz, E., 2007). Each of those has the capacity to change the brain far more than a lecture. Keep feedback real and don’t make the mistake of protecting a student’s feelings. Give honest feedback and do it in a kind, loving way. Otherwise, they can’t possibly figure out what to do differently next time. Kids over the age of 10 are able to hear quality, constructive feedback. When possible, allow the task itself provide feedback—play the wrong note and it sounds bad or play “Simon Says” and you’re the only one standing. Task generated feedback means you’ll make use of a successful (or failed) experiment, computer-based games, an object that is built, or a sound or visual that connects to the task. This keeps the feedback fast and task- specific. No judgments. Kids do not need a lecture about what they could have or should have done. You’ll lose your relationship with kids when you criticize and demean them. Focus only on actions that they have control over and the power to change. This means effort (practice or degree of intensity), strategy (e.g. a study method) and attitude (“I will succeed”). You might offer a more creative approach, careful planning, persistence and effort, and a positive attitude. When things go wrong, avoid praising effort. After a failure, being complimented for “effort” not only makes kids feel stupid, it also leaves them feeling like they are stuck and can’t improve. When things go right, avoid praising ability. Otherwise they’ll think it was ability (vs. effort, attitude or strategy) that made things work. Vary the feedback. Use notes, email, visual cues, charts, rubrics, or checklists. You can also use peers, groups, teams and partners to provide feedback. If you don’t vary the feedback, kids will get tired of it and scores will drop. Bottom line, feedback drives student achievement. This is classic brain-based teaching. With these strategies, you can become very good at this. This is also why other factors work so well such as, formative evaluation, peer teaching, cooperative learning and self-questioning. In fact, you can see that there are countless ways to “package” the feedback. As long as it is done well, it can support better learning. One reason that certain computer-based programs are as successful as they are is that provide detailed, impersonal and immediate feedback. In the area of reading, a strong computer-based (it’s high in feedback) is the FastForword® program. Whenever something works, I always look for the science behind it. And when the science is good, the program is good. Remember, if you’re not using the latest science on learning (feedback is a core component) then students miss out. This is all about brain-based teaching. With some support, you can become very good at this.